There are three ways you can navigate the Help File. This will display the full index of the Help File, so you can search by topic. The key symbol presents an alphabetical list of key words that have been added to pages to narrow down the search. 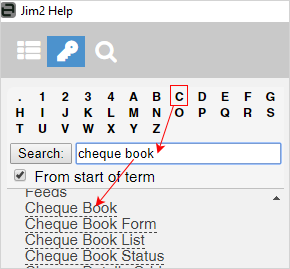 Select C, then either scroll to Cheque Book or type cheque book in the Search field. This will bring up the specific page or pages, if key words relate to more than one page. This is often the quickest way to find the correct page. The magnifying glass allows you to search using one word, or a combination of words. What this will return is a list of any pages that have one, any, or all of those words within the page, and can be quite a long list. It's also possible that it will return nothing, if none of the words appear on any page within the Help File. Free type search fully supports * and ? wildcards, ie. 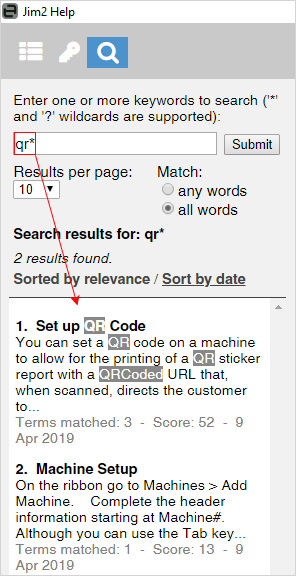 search QR* will bring up all pages related to QR codes. It's definitely worth a look at the key words to familiarise yourself with how they work, and please feel free to offer key word suggestions to make your searching experience easier (just email support@happen.biz). At the top right of screen, select More, then select Printable Version. This will bring up the Print dialog box, where you can make specific selections, ie. allow to print headers and footers and background graphics, etc. General Jim2 information and recommendations. 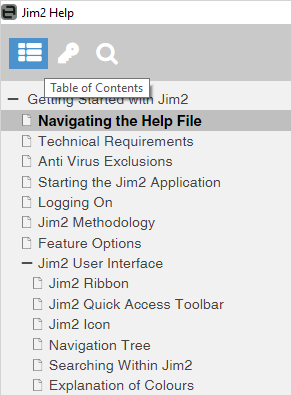 Jim2 hints to make your life easier. Essential information and important warnings – please do not ignore. Quality control/improvements aimed to assist you in your everyday use of Jim2.